Red-fronted macaw is a bird native to the small semi-desert mountainous region of Bolivia. 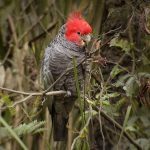 Their population declined as they were killed by farmers in the past for destroying their crops and for being poached extensively for pet trade. 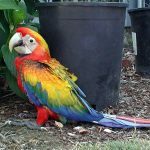 Also Known as Red-cheeked macaw. 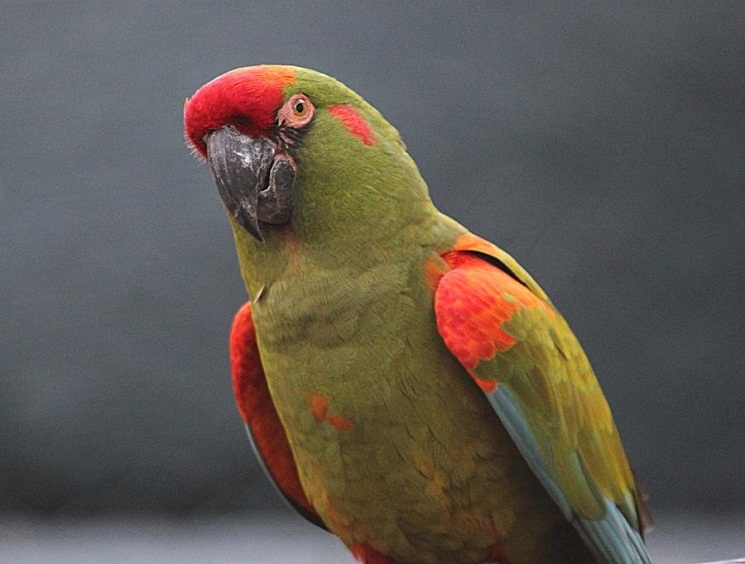 Color Chiefly green, it has a red forehead crown, a red patch on the eyes and reddish-orange shoulder and thighs. 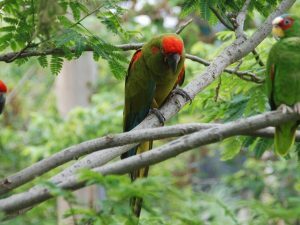 It has touches of pink around the eye that extends till the beak. The tail is olive-green with a bluish tip. The juveniles are similar to the adults but lack the orange-red coloration. Distribution Right from southern Cochabamba and west Santa Cruz, its range extends up to northern Chuquisaca and northeast Potosi in Bolivia. 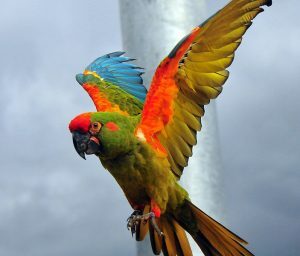 They are found in large numbers in valleys of Rios Grande, Mizque, and Pilcomayo. Habitat Subtropical climate, warm and dry with thorny scrub vegetation that has variety of cactus plants. Sounds and call Loud musical notes along with shrills, ringing and some growls as well as squeaks. 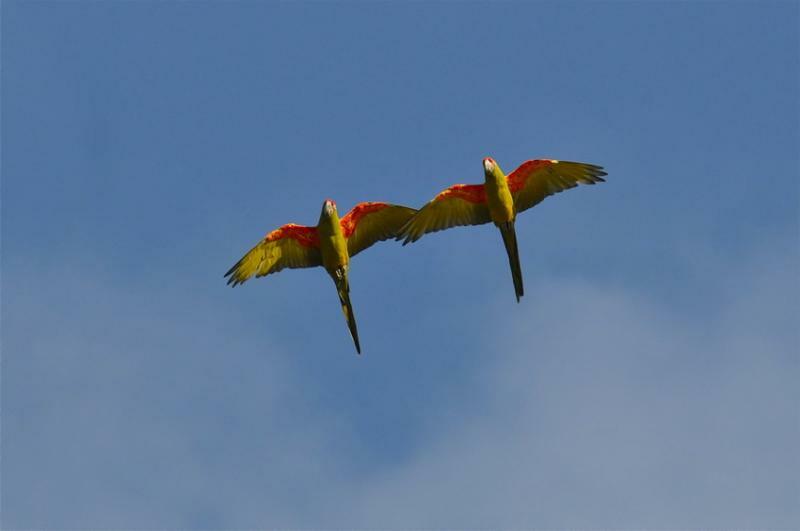 Pairs sing together. Juvenile calls are soft but highly pitched. Diet Seeds, fruits like Jatropha hieronymii, vegetables, nuts and cacti serves as their feed. Red-fronted macaws are lovely pets due to their playful and extrovert personality. 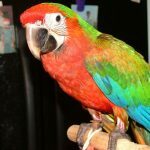 Hand-raised macaws adapt quickly and are easy to handle. Socialization must start at an early age to avert fearful behavior. They have a tendency to become nippy as well as destructive. 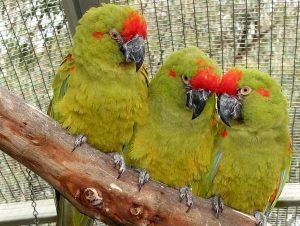 Mate aggression is uncommon among them but they get noisy during breeding. 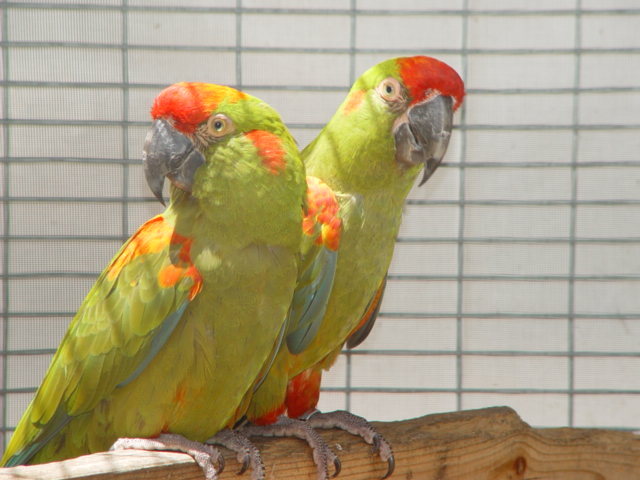 A generously large cage is ideal for them with ample room to extend their wings and to fly between the perches. 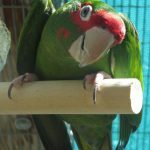 Cages must have durable wires, sturdy locks and escape proof latches since macaws are strong chewers and adept at picking locks. The nest box can be both horizontal as well as vertically shaped keeping ample amount of space in it. Add plenty of chewing material in their dwelling. 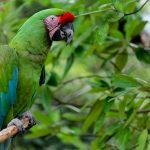 Feeding: What do red-fronted macaws eat? Red-fronted macaws require sufficient amount of energy for good health. 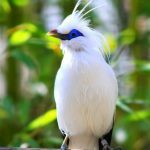 Their natural diet like the palm nut is rich in calories and oil. Feed them formulated food (pelleted or extruded) for proper nutrition. Fresh fruits and vegetables help in the physiological development of these birds. 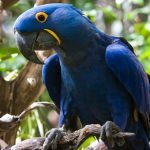 It is important to bathe the macaws regularly to keep their skin and plumage healthy. 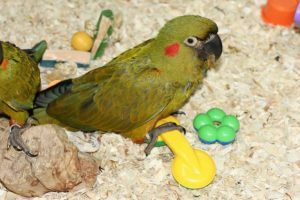 Sprinkle them with a hose by putting their cage outside and then allow them to dry up in the sun later on. 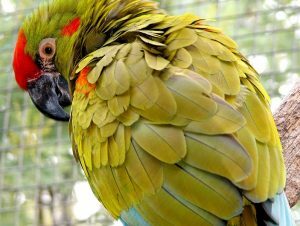 Red-fronted macaw costs around $1500. The Red-fronted macaw is a powerful flier, reaching speed up to 40 mph with ability to fly even in a sandstorm.